In 12-inch skillet, heat oil over medium-high heat. Add garlic and onions; cook 1 minute. Add ham and peas; cook 1 to 2 minutes, stirring frequently, until hot. Reduce heat to low. Stir in yogurt, dressing and milk. Add fettuccine; cook 2 to 3 minutes, stirring constantly, until hot. 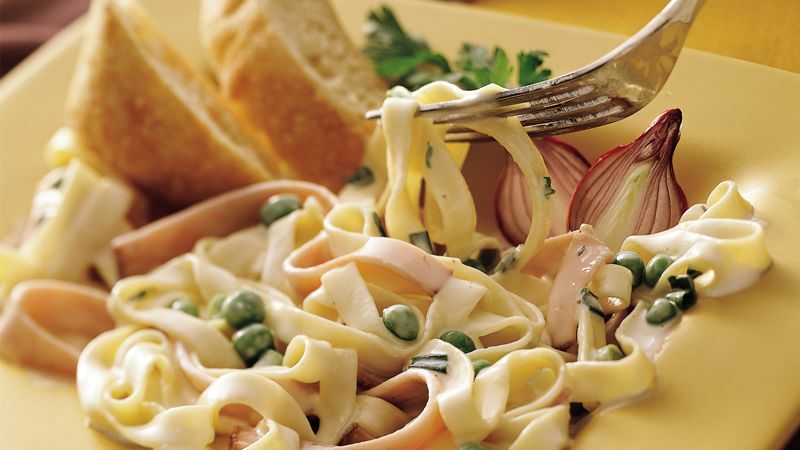 Refrigerated fresh pastas are convenient time-savers because they cook in just minutes. But you can also use 9 ounces of dried fettuccine; cook as directed on the package. Substitute your favorite frozen vegetable for the peas. To serve pasta hot, pour hot water into the serving bowl a few minutes before pasta is done. Just before draining the pasta, pour out the water and wipe the bowl dry.